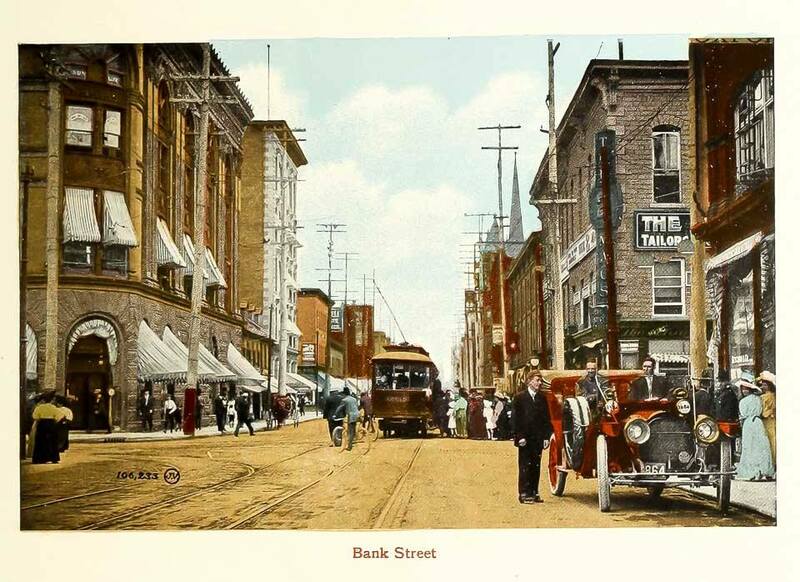 Postcard depicting the intersection of Bank and Sparks streets, looking south. Stephens Block is the stone building to the right. Undated. Last week, I wrote a short piece about Spero Andrews’ Embassy Restaurant, which was located at the south west corner of Bank and Sparks streets. As I concluded that story, I noted that there would be more to come, as that particular corner has, unsurprisingly, had a particularly storied history. In this instalment, I explore its history from R.W. Stephens’ purchase of the property to Peter Karson’s purchase of the the Rochester-Belmont Pharmacy, Tea Room, and Rainbow Tea Room. 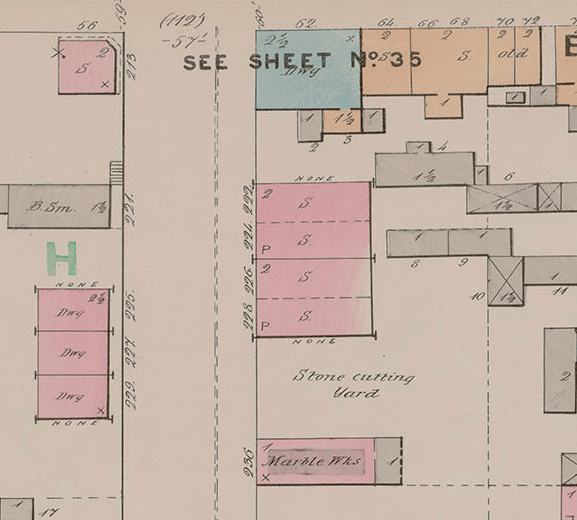 It’s a bit subtle, but it seems to be the case that the building depicted on the 1878 Goad’s Fire Insurance Plan was not the same as Stephen Block. Note the 2½ storey height and wooden roof. Moreover, the Journal reported that Stephen’s construction of the building in 1887. Image: Charles E. Goad. Insurance Plan of Ottawa, Ontario. Montréal: Chas. E. Goad, June 1878. Robert William Stephen arrived in Ottawa from Nova Scotia around 1861 in search of work.1”R.W. Stephens, Deputy Clerk of Senate, Dies,” Ottawa Journal, September 11, 1913, p. 13. After having briefly worked as a cabinet maker for an outfit on Rideau street, he quickly found himself a job as an agent with Wheeler & Wilson Sewing Machines,2Hunter, Rose & Co.’s City of Ottawa Directory, 1870-71 (Ottawa: Hunter, Rose, & Co., 1870): 106. as well as Howe & Ætna Sewing Machines,3Cherrier & Kerwin’s Ottawa Directory for 1872-1873 (Ottawa: Cherrier & Kerwin, 1872): 177. both of whose offices were based at 37 Sparks. By 1870, Stephen had relocated to his home at 62 Bank, the stone building on the corner of Bank and Sparks.4Hunter, Rose & Co. (1870): 106. In the fall of 1873 he took up a position as a clerk with the Senate, his place of employment until his retirement.5The Civil Service List of Canada, 1885 lists Stephen as the 2nd English Clerk & Clerk of Routine Proceedings, a position that he had only held since March 1884. When Stephen6Somtimes styled “Stephens“. His obituary cited above alternates the spelling between the headline and the text. was not clerking for the Senate, he assembled property around his home at Bank and Sparks and, in 1887, constructed Stephen Block on the very corner the house stood.7Stephens took out a $885 mortgage on the lot from Johnston Brown on August 8, 1864. Through some options and finagling, through his wife Victoria, he purchased from lot on December 24, 1867 from Charles Phinney for $1144, and on July 12, 1887, she transferred the deed to him. See Ottawa Land Registry Office, South Sparks / East, Lot 5, Reel 4AR117. The same corner in 1898. Image: Charles E. Goad. Insurance Plan of the City of Ottawa Canada and Adjoining Suburbs and Lumber Districts, 1888, Revised to 1898 and Lumber Districts to 1901. Montréal: Chas. E. Goad. It is unknown to me exactly what the nature of Stephens’ project was. It might have been a matter of a adding a third full flood to the existing stone building, or Stephens’ Block8It’s worth noting that Robert W. Stephens’ Stephens Block was the first of two along Sparks. The second one was constructed in 1896/97 for the A.J. Stephens shoe store along Sparks and is still standing. For the building’s announcement, see “To Grace Sparks Street,” Ottawa Journal, February 21, 1896, p. 1. may have been entirely new construction. Nevertheless, the Journal reported in September 1887 that “work of construction of the new Stephens’ block, on the corner of Bank and Sparks streets, is going ahead, rapidly, and Mr. Stephens expects to have the buildings ready for occupation by the last of November. The new block is a great improvement to the locality.”9”City and Vicinity,” Ottawa Journal, September 6, 1887, p. 4. The builder on the project was Johnston Brown, who had also constructed Dominion Hall around the corner and a large number of buildings at Shellington Farm.10”Laid at Rest,” Ottawa Journal, May 13, 1892, p. 1. His building was dubbed “Stephens Block”, had a civic address of 60 Bank Street, and was identified as such in the city directories in those years.11See for example, The Ottawa Directory, 1888-1889 (Ottawa: A.S. Woodburn, 1888): 15. At the far right: Stephen(s) Block, “The Busy Corner”, or just Bank and Sparks. Image: LAC Topley Series SE Accession 1936-270 Box 00594F Item 572. 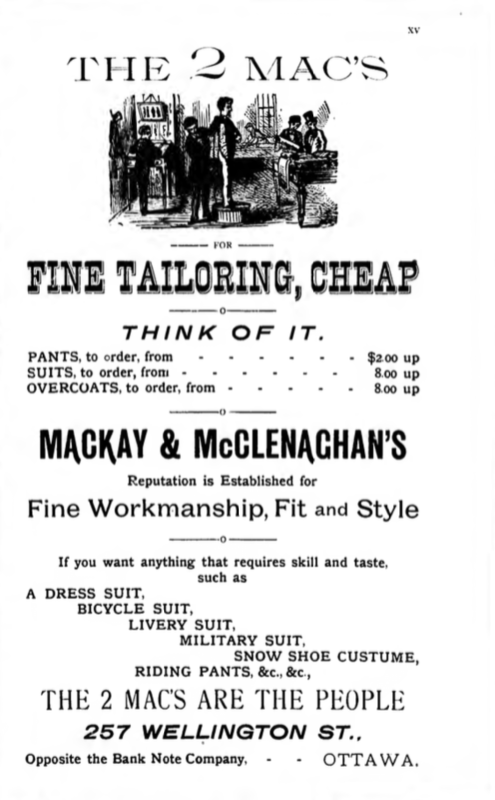 The tailoring firm of William McKay and Stewart McClenaghan, better known as the “2 Macs” moved their business from its location at 257 Wellington (opposite the British-American Bank Note Company) to Stephens Block in the spring of 1892:12Ottawa Journal, March 12, 1892, p. 4. A move that they were immediately satisfied with.13Ottawa Journal, April 6, 1892, p. 4. The 2 Macs’ business was run in a way that was very much fitting for the era. McKay and McClenaghan were operators in the highly competitive (and often difficult-to-differentiate) field of menswear. In a crowded room, the loudest voices are heard. The pages of the Citizen and Journal were filled with ads for The 2 Macs, often on multiple pages, announcing not only deep discounts, but advances made in the industry. Advertisement for the 2 Macs run in the 1891/92 City Directory. Source: 1891-1892 Ottawa City Directory. It was also in this context that these rules applied urban placemaking. Absent the sort of aggressive regulation of commercial signage that would eventually be brought in during the 1950s, most businesses were largely free to affix signs of most any size and shape to the facade and most took advantage of that.14There was a sign bylaw passed in 1917 which was, for the most part, modest relative to what was to later come and was generally most concerned with illuminated, rather than traditional painted signs. See “Electric Signs May Have Eight Ft. Width,” Ottawa Journal, August 4, 1916, p. 11; “In Future Signs Will Be Under Civic Control,” Ottawa Journal, July 17, 1917, p. 6; “The Sign Bylaw,” Ottawa Journal, July 21, 1917, p. 4; “Agents Of Govt. Fights Citizens Alderman Says,” Ottawa Journal, August 8, 1917, p. 9; “B. Slattery Asks For A New Park For Ottawa East,” Ottawa Journal, September 12, 1917, p. 14; “Mr. 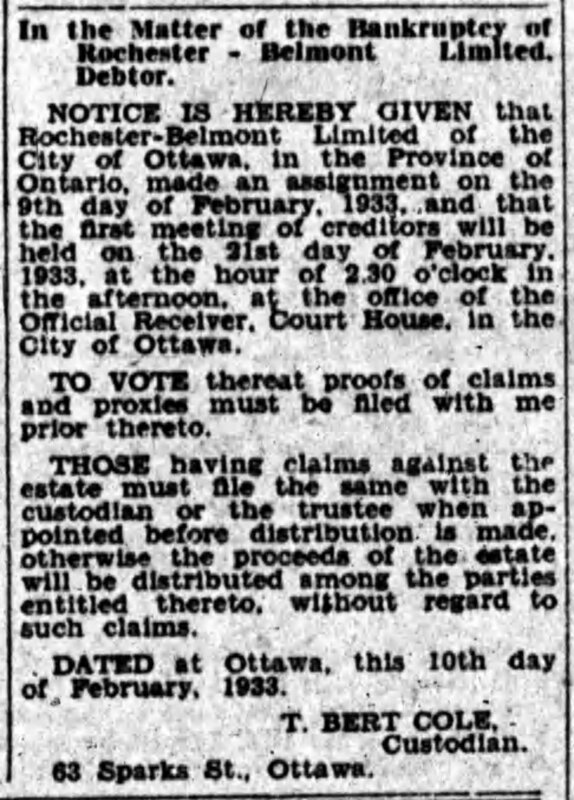 Fisher Refuses To Back City Bill,” Ottawa Journal, March 17, 1924, p. 2. Also see Alain Miguelez. Transforming Ottawa: Canada’s Capital in the Eyes of Jacques Greber (Ottawa: Old Ottawa Press, 2015). Of this, The 2 Macs was no exception. Stephen Block was architecturally unremarkable, but with the signs affixed to much of the available stone, including a large one that ran up the building’s corner, The 2 Macs was difficult to miss. In addition to creating place in space, The 2 Macs did so in the imagination of Ottawans. Advertising the outlet as being located in Stephens Block would not bode well, especially when another – more architecturally compelling – Stephens Block was completed in 1897. Beginning that year, The 2 Macs’ advertisements began to refer to the corner as “2 Macs Corner”, with the tagline “the busiest corner on the busiest street.”15Ottawa Citizen, April 27, 1897, p. 1. By 1898, it had become “The busy store at the busy corner,”16Ottawa Journal, July 11, 1898, p. 6; Ottawa Journal, October 8, 1899, p. 6. and before long, Ottawans came to adopt “The Busy Corner” as the name for Bank and Sparks.17Ottawa Journal, March 22, 1900, p. 7; Ottawa Journal, August 25, 1900, p. 6. For examples occurring long after the closure of The 2 Macs, see “Chivalry Seen At Busy Corner,” Ottawa Journal, July 14, 1938, p. 16; Karson’s Restaurant continued to use the name: Ottawa Journal, September 19, 1940, p. 18; “Tram Jumps Track At Busy Corner Ties Up Traffic,” Ottawa Journal, December 27, 1946, p. 20; Ottawa Journal, February 4, 1949, p. 16; Ottawa Journal, July 21, 1951, p. 3; Ottawa Journal, December 26, 1958, p. 6; W.Q. Ketchum. “Ottawa’s Verdict: ‘Mall a Marvellous Job’,” Ottawa Journal, May 20, 1960, p. 3; Ottawa Journal, July 23, 1960, p. 3; Gord Lomer. “Below the Hill,” Ottawa Journal, June 18, 1965, p. 25; W.Q. Ketchum. “Faces of Ottawa: William Donald Cutler,” Ottawa Journal, October 24, 1970, p. 2. Before it was the Embassy. Source: Public Works / LAC Accession 1979-140 NPC Box RV1-036 Series CP-678. Be it evidence of entrepreneurial wizardry, a great location, or simply being pulled along in the currents of a recovering economy in a town in which government was slowly becoming the town’s main business, The 2 Macs thrived. By 1902, the business had come to absorb the entirety of Stephens Block. McClenaghan’s announcement in the Journal identified the other businesses present in the building, which included Dr. Baird’s dental parlour.18”Mc. McClenaghan Obtains Control Over the Entire Block on the ‘Busy Corner’,” Ottawa Journal, December 17, 1902, p. 3. Ottawa Journal, January 8, 1910, p. 4. R.W. Stephens, despite his advanced age and poor health, not finished with the block either. On September 6, 1913, the Journal reported that Stephens had planned a new commercial building around the corner, at 217 Queen (see excerpt from Goad’s Insurance Plan below), again to replace the home he had been living in. The building had been designed by James Mather and it would be five storeys to begin with and Stephens mused that it would be expanded upwards to 10. 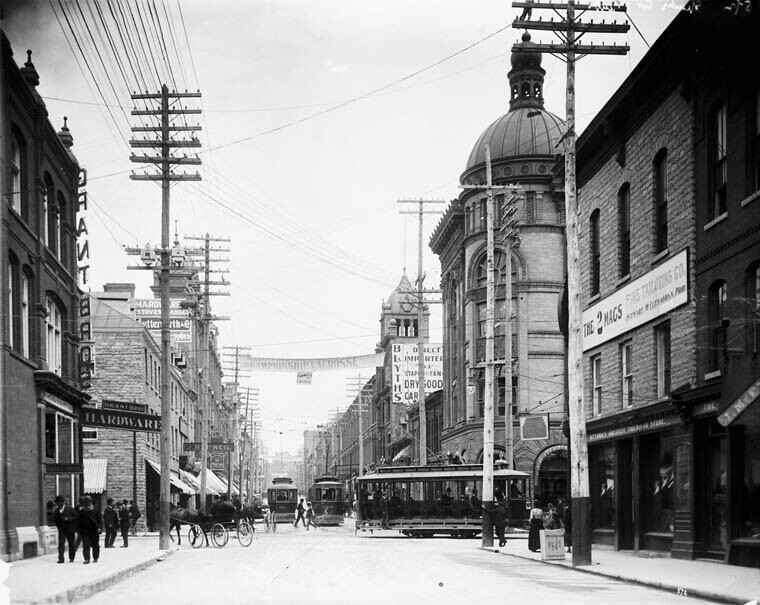 Finally, it was reported that Stephens had contemplated a rather significant renovation of the space occupied by The 2 Macs, once the lease was up in 1915.19”Another Big Queen St. Building,” Ottawa Journal, September 6, 1913, p. 1. It was likely a combination of Stephens’ death just days later, the recession that took hold in 1913,20”R.W. Stephens, Deputy Clerk of Senate, Dies,” Ottawa Journal, September 11, 1913, p. 13. Stephens was also integral to seeing through the construction of the Masonic Temple that once stood on Metcalfe. the First World War, and a long delay in the Canadian economic recovery that would see the renovations put on hold. In 1923, the Journal reported that plans had been made for a new four storey building to be constructed on the site, but it does not appear to be the case that this was ever commenced with.21”New Business Block For ‘Busy Corner’,” Ottawa Journal, January 25, 1923, p. 1. Charles E. Goad. Insurance Plan of the City of Ottawa Canada and Adjoining Suburbs and Lumber Districts, 1902, Revised to 1912. Montréal: Chas. E. Goad. It does not appear to be the case that the new building was to happen. Where the Journal reported that a “four-storey and basement modern concrete and steel building” would “replace the present stone building known as Stephen Block”,22Ibid. advertisements for The 2 Macs run in the days immediately following the announcement promoted a “remodeling” sale.23Ottawa Journal, January 26, 1923, p. 14. By the time The 2 Macs’ 34th Anniversary sale rolled around, it was still in The Busy Corner and still being communicated as a renovation and not a replacement.24Ottawa Journal, March 16, 1923, p. 16. 34 years (31 at The Busy Corner) and counting. Source: Ottawa Journal, March 16, 1923, p. 16. The holdup? The City had planned to widen Bank Street at the time and until an agreement about the size of the widening could take place, the project was in some limbo. Trouble first appears to have started brewing at the beginning of February when the architect working on the design for the new building was informed that the Board of Control wanted the corner rounded.25”Won’t Continue Wall Along Rideau Canal,” Ottawa Journal, February 7, 1923, p. 15. Without being given a definitive answer, through his lawyer Harold Fisher, Charles Stephens communicated to the Board that if he did not receive a firm answer as to what the city was prepared to do with the 49 feet of property, that he’d instruct the architects to to go ahead with the squared corner design. True to form, the Board discussed the issue at length, but arrived at no conclusion.26”Earlier Elections Depend on Assessor,” Ottawa Journal, March 7, 1923, p. 4. In light of the challenge, it was perhaps a blessing to the Board that Ottawa’s Works Commissioner McCallum found that the Stephens property encroached on Bank street by one foot and on Sparks by six inches.27”Board of Control Recommends The Appointment of Successor to Head of Charity Department,” Ottawa Journal, March 14, 1923, p. 14. We believe in ‘travelling light,’ so if we must move we don’t want to carry the big stock of new Spring merchandise we have now. 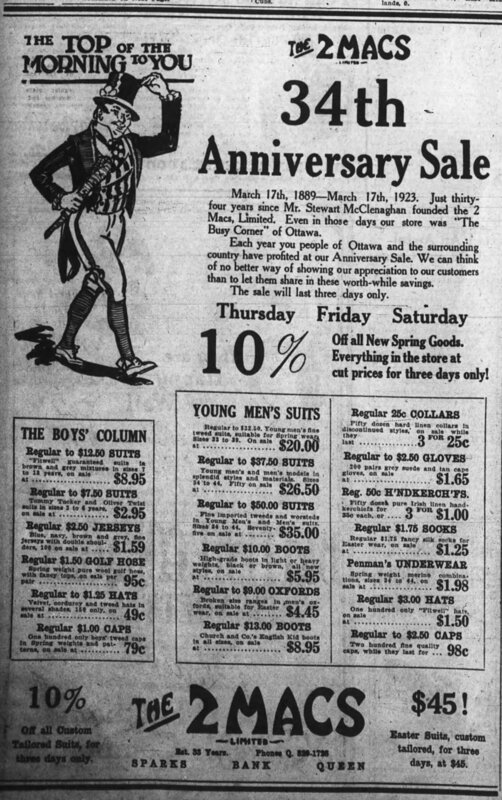 So out it goes at the peak of the Spring season just when everybody needs new clothes.28Ottawa Journal, April 10, 1923, p. 14. As the political back-and-forth over the Bank street widening dragged on through the spring, the Ottawa Real Estate Board weighed into the affair, standing in opposition to the project on the basis that it was “absurd, absolutely beyond reason, and too costly.” At that stage, the widening was to cut 33 feet from the Stephens and Bate properties between Sparks and Queen and from the Bank Street Chambers between Queen and Albert. The estimated cost was $2,000,000. If the widening were to extend down to Somerset it would be another $2,000,000 and would threaten the beautiful (and still quite new) Jackson Building. Just how the city came up with the 33 foot number was questioned openly.29”Oppose Widening of Bank St. Blocks,” Ottawa Journal, April 25, 1923, p. 13. Noulan Cauchon of the Town Planning Commission was the main proponent of the 33-foot plan, though in discussions, a second 16½ foot plan was proposed by C.R. Stephen. No agreement between the two schemes had been reached by the end of April.30”Board Discusses Bank Street Width,” Ottawa Journal, April 27, 1923, p. 2. 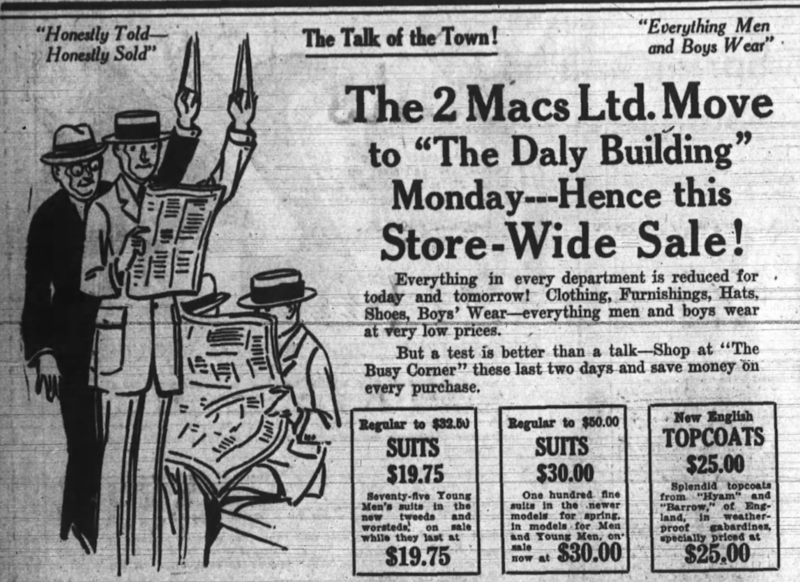 In the meantime, The 2 Macs secured themselves a new location in the Daly Building.31”Two Macs To Move To Daly Building,” Ottawa Journal, April 26, 1923, p. 22; Ottawa Journal, April 27, 1923, p. 16. The 2 Macs did not move to the Daly Building in the end, but rather moved to 194-196 Sparks Street, just on the other side of the Sun Life building on the opposite corner. Neither the sluggish economy nor the new location (however close) were kind to The 2 Macs: the business had shuttered by the Fall of 1925. See Ottawa Journal, May 15, 1923, p. 16; Ottawa Journal, May 16, 1923, p. 16; Ottawa Journal, September 5, 1925, p.18. Store fixtures were liquidated in the Spring of 1926 after the remaining stock was. See Ottawa Journal, March 16, 1926, p. 15. The 2 Macs bid The Busy Corner farewell in April 1923. Source: Ottawa Journal, April 27, 1923, p. 18. With no agreement in sight and frustrations mounting, Stephen, through Fisher announced that, “unless some action was taken by the city on the whole question, he would apply for a court order Wednesday [May 9th] for a building permit.”32”Select Toronto Man For Social Service,” Ottawa Journal, May 7, 1923, p. 4. As Fisher’s deadline had come, the Board of Control asked him to hold off on the threat until Friday. 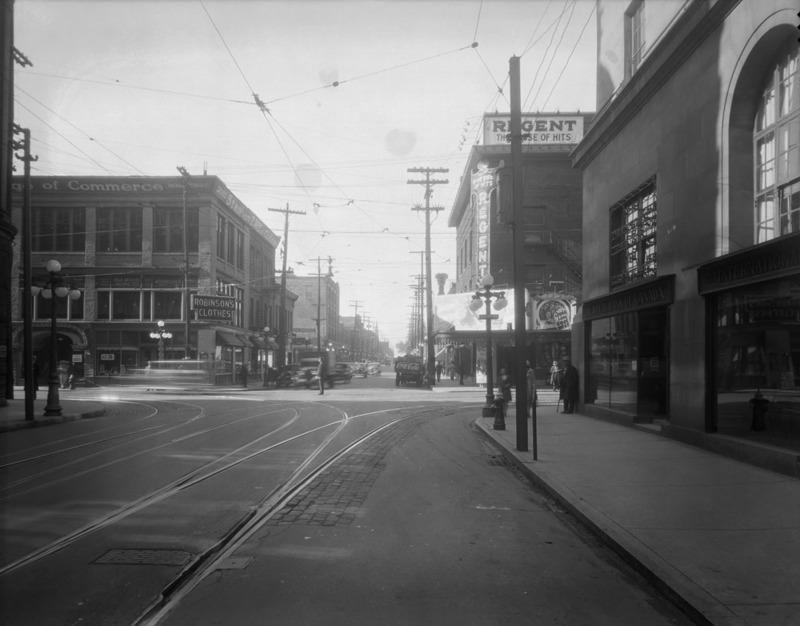 They reasoned that the Bank street merchants that would be effected by the widening were to hold a meeting on that evening [May 11th], and it would be fair for them to have input. A special Board meeting would be held on Saturday to deal with the petitions.33”Ottawa Adds Appeal For Lower Coal Rate,” Ottawa Journal, May 9, 1923, p. 15. After much negotiation, the Board of Control agreed to the 16½ foot plan, which was supposed to come at a cost of $115,000.34”Widening Of Street Rejected By Council,” Ottawa Journal, May 23, 1923, p. 5. The hard-fought battle was all for nought, however. By a vote of 12 to 6, Ottawa City Council rejected the plan. Alderman P.J. Nolan (who will become important to this story soon) was entirely opposed to widening on the west side and suggested that if there had to be a widening, that it take place on the east side. Businesses on the east side were similarly opposed.35Ibid. By the time the road widening had been successfully fought off, plans for a completely new building were placed on the back-burner. The extensive renovations that were promised by Stephen were completed by the fall of 1923. 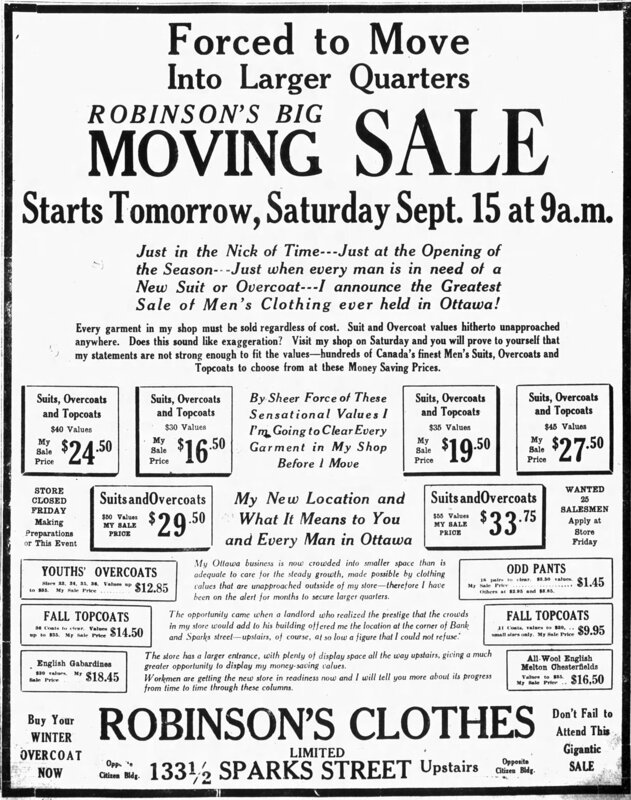 As he was out his prominent clothing retailer, Stephen was able to successfully attract the Ottawa outlet of Robinson’s Clothes to the renovated building.36Ottawa Journal, September 14, 1923, p. 15. As a nationwide chain of clothing stores, Robinson’s made a name for itself by being the first to offer discounts to returned soldiers of the First World War.37Nathan Smith. Comrades and Citizens: Great War Veterans in Toronto, 1915-1919 (PhD diss. : University of Toronto, 2012): 32. M.C. Robinson was offered a deal he could not refuse. Source: Ottawa Journal, September 14, 1923, p. 15. Robinson’s Clothes would go on to remain at the Busy Corner itself until about 1948,38The last mentions of Robinson’s Clothes I was able to find in the Journal were in 1946, when an OTC streetcar jumped the tracks in front and when the building experience another fire in 1947. The Citizen’s archive, as reproduced on Google News is far too spotty in the time period to make a call on it. See “Loaded Tram Jumps Track,” Ottawa Journal, February 26, 1946, p. 20; Ottawa Journal, June 17, 1947, pp. 1, 12. when Arthur Murray Dance Studio opened on the second flood of Stephens Block.39Ottawa Journal, February 26, 1948, p. 30; Ottawa Journal, September 18, 1948, p. 15. Arthur Murray remained in the space until the winter of 1970, when it appears that it was taken over by Don Renaud’s Golf School.40Ottawa Journal, February 3, 1970, p. 27. By the spring, ads for Renaud’s Golf School had been run for the address, 62½ Bank, came to replace those for the dance school. See Ottawa Journal, March 21, 1970, p. 14. Detail view. Source: Public Works / LAC Accession 1979-140 NPC Box RV1-036 Series CP-678. Departure of The 2 Macs also marked a new beginning for the ground floor of Stephens Block. Robinson’s only required the second floor, leaving ample opportunity for a new face at ground level. In November 1923, after The 2 Macs had decamped and Robinson’s took over its former (albeit remodelled space), The Busy Corner found itself with a new tenant on the ground floor’s two spaces.41I should also note that of the storefronts in the brick building (64-82 Bank Street), The 2 Macs had been present in a number of them before moving to Sparks Street. As The Embassy was only present in 60 and 62 Bank, my focus is on those addresses. David Baird, Stephens Block’s long-serving dentist opened a new dental parlour on the second floor, vacating his previous ground floor unit.42Baird’s practice had been located in Stephens Block since 1898. Ottawa Journal, November 14, 1923, p. 23. The Belmont Pharmacy and its Tea Room opened on November 24, 1923 at 60 and 62 Bank. Source: Ottawa Journal, November 23, 1923, p. 14. The Belmont Pharmacy and Tea Rooms was the business venture of Myer J. Isaacs and Hyman Horlick. 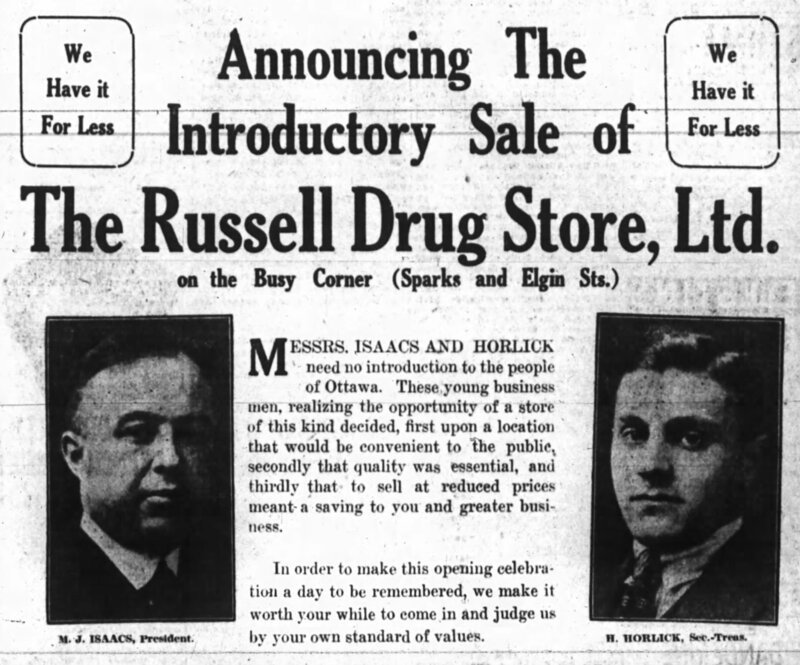 The Belmont was the second drug store business that the pair built, having founded the Russell Pharmacy at the corner of Sparks and Elgin streets just two years previous.43Ottawa Journal, February 10, 1921, p. 13. Before getting into the drug store business, Isaacs briefly operated as a furrier in the Russell Building, in a unit recently vacated by the Canadian Northern Railway system. See Ottawa Journal, December 2, 1919, p. 8. 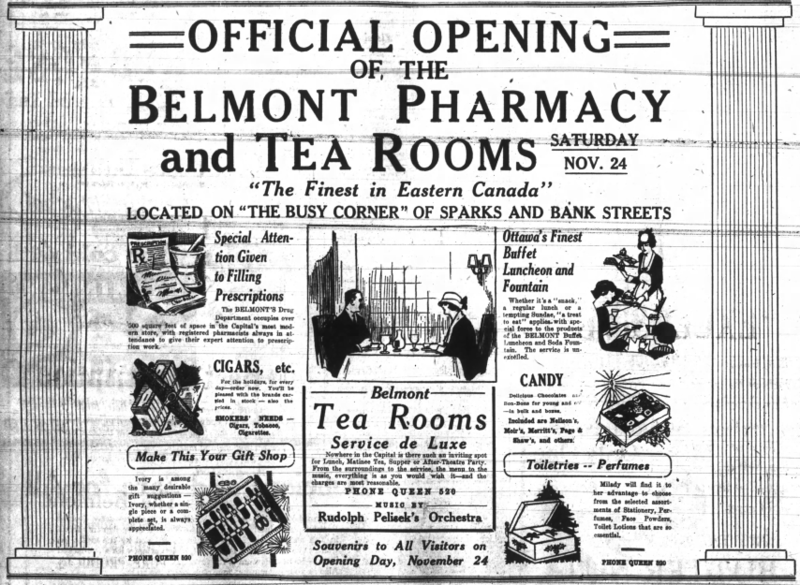 The Belmont was not a small pharmacy: at 2,000 square feet, it not only contained the expected drug section, confections, and tobacco, but the tea room and 41 foot soda bar was said to accommodate 200 patrons.44Ottawa Journal, November 23, 1923, p. 14. Perhaps Isaacs and Horlick decided to open a second drug store at Bank and Sparks because they longed for the “real” Busy Corner. Source: Ottawa Journal, February 10, 1921, p. 13. As James Rattray Wilson was the architect for the entire Stephen Block’s remodelling, he was so for the Belmont Pharmacy.45Ottawa Journal, November 23, 1923, p. 15. Wilson had just completed the design for the Beach Garage, at Bank and Catherine when he moved on to the new project. As an architect, Wilson does not appear to have been particularly busy, but – quite interestingly – his strength may have been such remodelling projects as his training in electrical engineering lead him to study the performance of lighting on various surfaces extensively.46J. Rattray Wilson. “Electric Lighting for Dwelling Houses,” The Western Architect 17, no. 2 (February 1911): 22-26. Isaacs and Horlick did not keep the location for long, opting to sell to pharmacist J. Lorne Rochester in 1925. Rochester was not a stranger to the intersection, having operated a pharmacy at 214 Sparks beside the Sun Life building until 1911 (being replaced by a branch of the Dominion Bank that year).47The Ottawa City Directory, 1909 (Ottawa: Might’s Directories Ltd., 1909): 135; The Ottawa City Directory, 1912 (Ottawa: Might’s Directories Ltd., 1912): 150. “After 14 years” Rochester announced his return to The Busy Corner, this time on the southwest corner. “Once again – ‘Lorne’ is there – ready with the glad greeting and the happy smile.”48Ottawa Journal, September 14, 1925, p. 2. Under new ownership, the pharmacy at the corner of Bank and Sparks was rechristened the Rochester-Belmont Pharmacy.49Ibid. The corner in 1926. Note that the Metropolitan Life building was under construction. Image: City of Ottawa Archives, Item CA-18235. 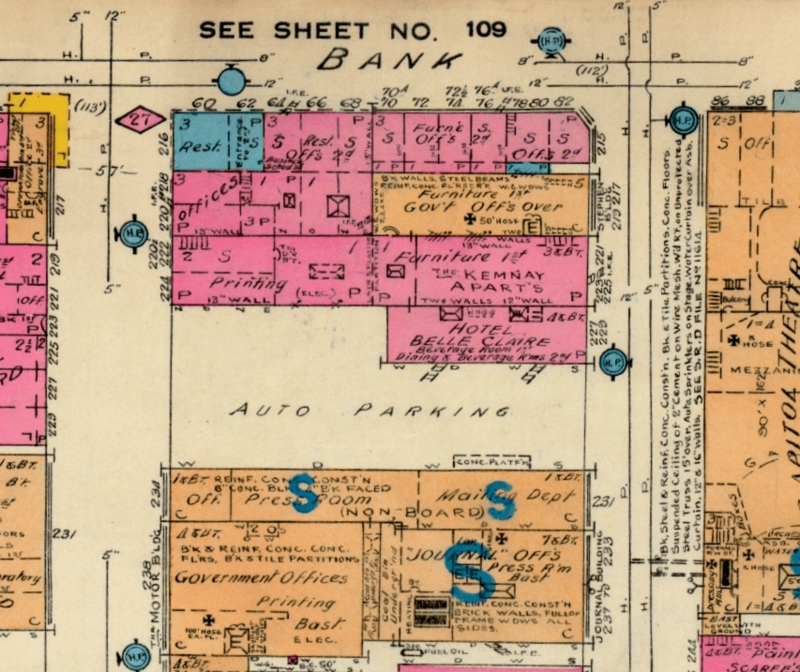 Stephens Block suffered the first of what would be a number of fires on March 8, 1926: an event that cut some of revelry in Rochester’s return short. 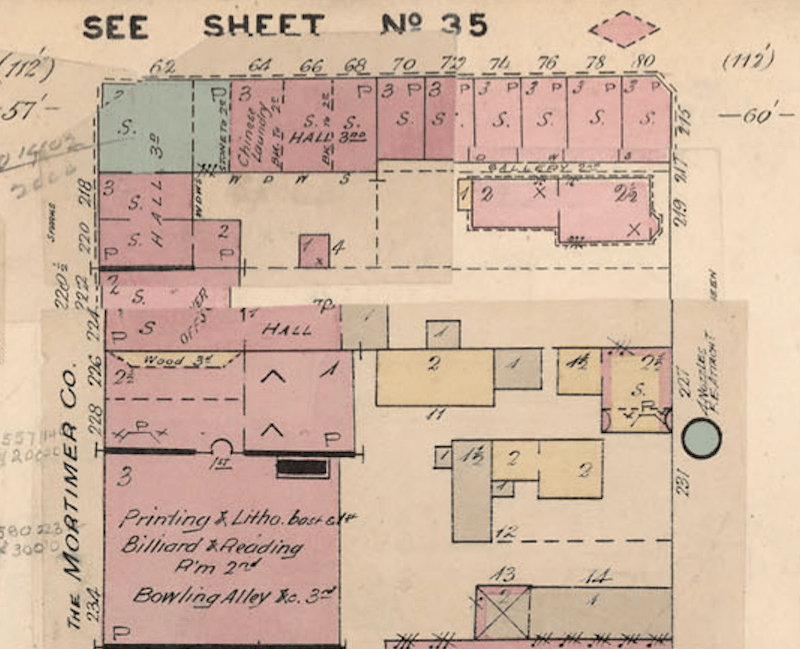 The fire started – and fortunately remained – in the basement beneath the adjacent Hwaiking Shop (a storefront operation that sold handicrafts from Chinese and Japanese mission schools), Betty Brown Candy Shop, and Edwards Ladies’ Wear. While damage to the building was said to the kept at a minimum, merchants on the first and second floors all suffered extensive smoke and water damage.50”Big Loss By Smoke In Bank St. Fire,” Ottawa Journal, March 8, 1925, pp. 1-2. 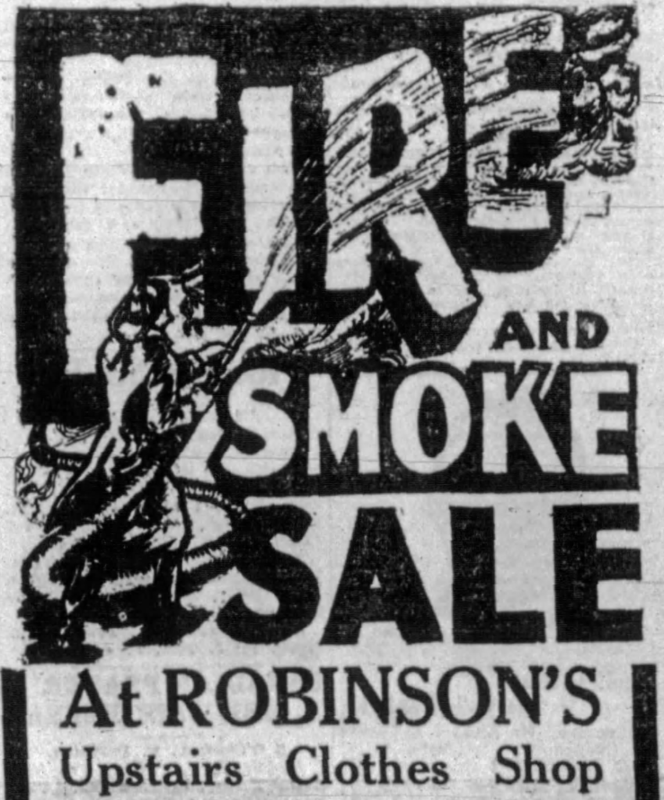 After the fire in March 1926, Robinson’s held a large sale on the smoke damaged goods. Rochester-Belmont seems to have escaped mostly unscathed. Source: Ottawa Journal, March 17, 1926, p. 17. 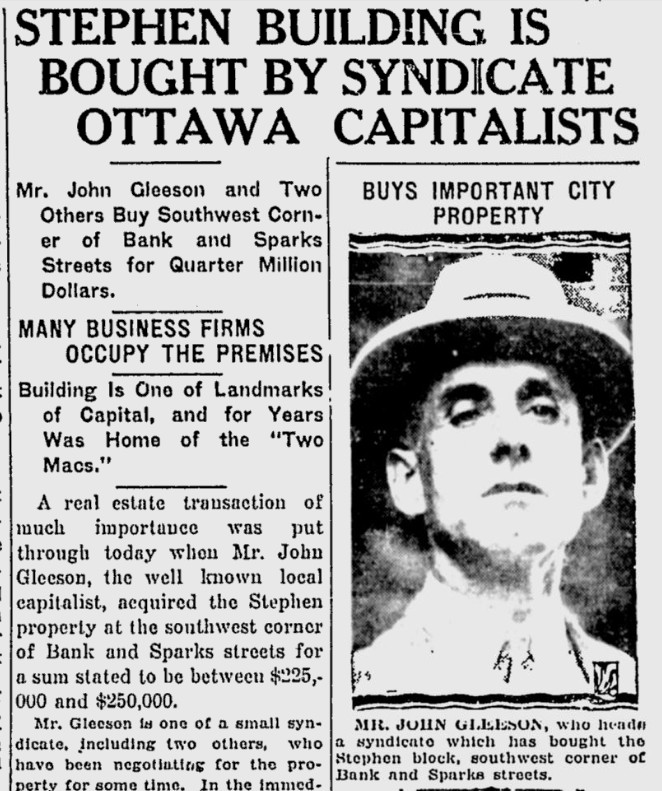 In December, it was reported that a small local syndicate, headed by John Gleeson, purchased Stephens Block from the Stephens Estate for $225,000 to $250,000.51”Stephen Building Is Bought By Syndicate Ottawa Capitalists,” Ottawa Citizen, December 17, 1926, p. 1. Gleeson did not have any plans for the property at the time of reporting, and was only willing to state that the home of the Rochester-Belmont Pharmacy was purchased as an investment. The deal not only included the Stephens Block, but the Stephens Building, which fronted on Queen Street.52Ibid. ; “Stephens Block Changes Hands In Large Deal,” Ottawa Journal, December 17, 1926, p. 1. The syndicate that Gleeson represented was Sovereign Real Estate and the final purchase price on the Stephens deal, which was closed on December 31, 1926, was $200,000.53Ottawa Land Registry Office, Plan 3922, South Sparks, East Portion, Lot 5, Reel 4AR117. The remainder of the Bank street frontage, which was held by the H.N. Bate Realty Corporation, was purchased by Sovereign in January.54”Important Sites Are Purchased On Two Streets,” Ottawa Journal, January 24, 1927, p. 2. This later purchase meant that Sovereign owned the entire Bank street frontage between Sparks and Queen. John Gleeson looking particularly enterprising on the front page of the Citizen. Source: Ottawa Citizen, December 17, 1926, p. 1. On November 3, 1927, the Citizen reported Sovereign’s vision for the block. Although Gleeson stressed that it was strictly provisional (and perhaps aspirational), he was planning on the construction of an ornate seven-storey office building with seven storefronts along Bank street. As a number of the building’s tenants – including Rochester-Belmont – had much time left on their leases, the project’s time frame was yet to be seen.55”1928 Looks Like Another Banner Year In Ottawa,” Ottawa Citizen, November 3, 1927, p. 1. The Journal reported the following day that all of the tenants had received letters stating that their leases were poised to expire the following May and that there was a chance that they would not be renewed.56”May Not Renew Tenants’ Leases,” Ottawa Journal, November 4, 1927, p. 19. Once again plans to demolish the aging commercial buildings along the west side of Bank street were put on ice. No reasons were given for the decision, so it may have been an inability to gain the cooperation of the longer term tenants or Sovereign may have stretched its ability to raise capital thin.57Gleeson had been busy through 1928 as well, raising capital for the Victoria Building on Wellington. See Ottawa Journal, February 27, 1928, p. 15. Whatever the reason, there had been no grand replacement building constructed. Because of this stay of execution, Rochester went ahead and had constructed his Rochester-Belmont Tea Room Annex (later renamed the Rainbow Tea Room), a project that catered to the growing demands in the area for tea and the light lunches the tea room had come to be known for. 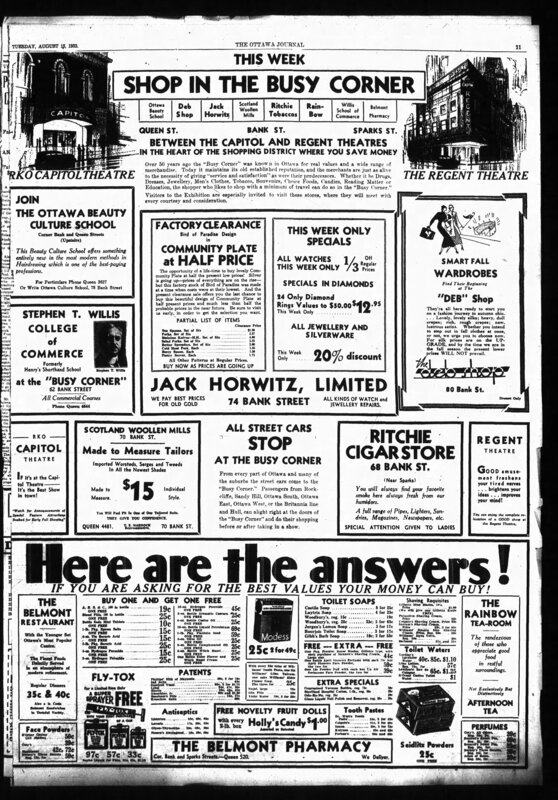 It opened officially on Saturday, June 22.58Ottawa Journal, June 21, 1929, pp. 14-15; Ottawa Journal, October 5, 1929, p. 12. Source: Ottawa Journal, May 31, 1930, p. 13. Fire struck Stephens Block once more. On August 1, 1932, the Journal reported that a fire broke out in the Rochester-Belmont basement, with flames spreading up the walls of the aging building. The fire was not only stubborn, but the nature of the drug store business meant that firefighters had to also brave ammonia fumes while they were working to control the conflagration. Unlike the fire in 1925, this one did weaken the structure in the building, in this case, of the tea room. Most of the stock was rendered unsaleable, resulting in more than $15,000 in damage. Rochester was at a loss for the cause of the fire, having sent an employee to the basement at close to ensure that the stockroom was in good order.59”Ammonia Fumes Hamper Firemen In $15,000 Blaze,” Ottawa Journal, August 1, 1932, pp. 1,2. Perhaps arson was the answer. A fire broke out in the building on August 23 in a first floor restroom and again on the 30 in the same fashion. Fire Chief S.B. Blackler felt that it appeared to be (at least) two cases of incendiarism.60”Say Incendiarism Cause of Outbreak Bank and Sparks,” Ottawa Journal, August 31, 1932, p. 20. Within weeks, once the damage had been assessed, Continental Salvage ran a fire sale on behalf of Rochester-Belmont. Source: Ottawa Journal, August 19, 1932, p. 2. What began as a suspicion ended in a full-blown hunt for a local firebug. As the fires in the neighbourhood continued through September in a number of buildings, there came to be a worrying realization that none of seemed to be accidental. That October, the Ontario Deputy Fire Marshall called an inquiry which saw more than 50 people called to the stand. Blackler was of the opinion that the fires were likely the work of an individual who had been at work for about four or five years.61”No Firemen Under Suspicion of Chief Blackler,” Ottawa Citizen, October 4, 1932, pp. 1, 8. Some of the other buildings targeted included the Embassy Theatre,62Originally the Family Theatre. See “Loss is $15,000 When Theatre Scene of Fire,” Ottawa Journal, August 6, 1932, p. 4. For more information about the Embassy, see Alain Miguelez. 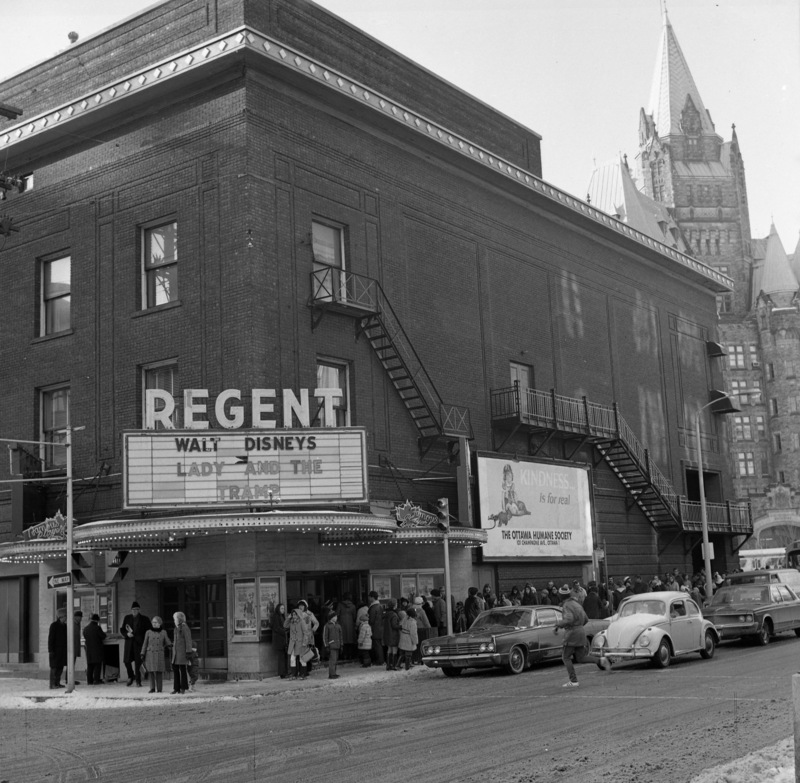 A Theatre Near You: 150 Years of Going to the Show in Ottawa-Gatineau (Ottawa: Penumbra Press, 2004): 68-80. the Cyr Hotel (Murray Street)63”Cyr Hotel Suffers $15,000 Damage In Early Sunday Fire,” Ottawa Journal, September 19, 1932, p. 3. the Windsor Hotel, Dominion United Church, the Somerset Apartments (Bank and Somerset), Stephen Block (2-3x), Freedman’s Wholesale (York), and a number of others. In each of these cases, a hole was found punched in a restroom, flammable materials stuffed in them, and lit on fire.64”No Firemen Under Suspicion of Chief Blackler,” Ottawa Citizen, October 3, 1932, p. 8. George Lewis’ inquiry was to take three days and it began on October 4.65”50 Witnesses Called For Ottawa Fire Inquiry,” Ottawa Journal, October 4, 1932, p. 1. That day, 23 witnesses gave testimony over more than four hours. Although the testimony provided confirmation that the fires all shared a number of similarities (as noted above), another surprising pattern emerged: four of those who testified identified J. Roy MacRostie, a fireman at Station No. 7 (Arthur Street), to have been at the scene of some of the fires just before they began. The evidence provided in the inquiry was quite suggestive: MacRostie was out of his district, purportedly to conduct “inspections” and he had on his person matches and a bottle opener with peculiar wear marks.66”Evidence Reveals Similarity Of Recent Suspicious Fires,” Ottawa Journal, October 5, 1932, p. 3. MacRostie did not do himself any favours in the proceedings either. From the get-go, it does not seem to be the case that he mad much respect for the proceedings and by the second day of the hearings was found in contempt for refusing to answer certain questions. For his contempt, he was given 20 days in jail and fined $15.67”Marshal Hints at Charges Unless Fireman Will Talk,” Ottawa Journal, October 7, 1932, p.25. Reporting in the Journal characterized MacRostie, then under indefinite suspension from the Fire Department, as generally polite, but clearly uncooperative with the inquiry.68Ibid. In spite of this characterization, the Journal’s editorial board was clearly troubled by MacRostie’s being jailed for contempt, especially as a Fire Marshal’s inquiry was not a standard court proceeding.69”Contempt of Court,” Ottawa Journal, October 14, 1932, p. 4. For his own part, MacRostie chose to keep his silence and serve out his 20 days.70”To Stay In Jail Until Term Ends,” Ottawa Journal, October 19, 1932, p. 19. Fire Marshal Lewis had not yet decided what to do with MacRostie at the end of the twenty days, though thanks to the use of expert analysis of the physical evidence, Lewis had continued to build a case.71”Has Not Decided What He Will Do With MacRostie,” Ottawa Journal, October 25, 1932, p. 1. The following day, MacRostie was arraigned before Magistrate Stike on two charges: one of setting fire to the Somerset Apartments and one of attempting to do so to the Windsor Hotel. Cool as a cucumber, he opted through his lawyer for a trial by jury.72”City Fireman Is Remanded For One Week,” Ottawa Journal, October 26, 1932, p. 1. Without belabouring the story much longer, for a variety of reasons, the jury did not find the Crown’s case entirely persuasive. MacRostie was acquitted of the first charge on December 773”Defence Council for City Fireman Announces He Will Ask for a Re-trial Immediately- Accused Goes to Stand,” Ottawa Journal, December 8, 1932, p. 5. and after a re-trial, the second charge on June 6 the following year.74”Roy MacRostie Given Acquittal,” Ottawa Journal, June 7, 1933, p. 3. Rochester quickly picked up the pieces and reopened his Rochester-Belmont Pharmacy. Source: Ottawa Journal, October 7, 1932, p. 16. While Lewis’ inquiry was in progress, Rochester had picked up the pieces and reopened his business. Though substantially similar in appearance, he took the opportunity to invest in a few equipment upgrades, those in the tea room being perhaps the most important.75Ottawa Journal, October 7, 1932, pp. 16-17. 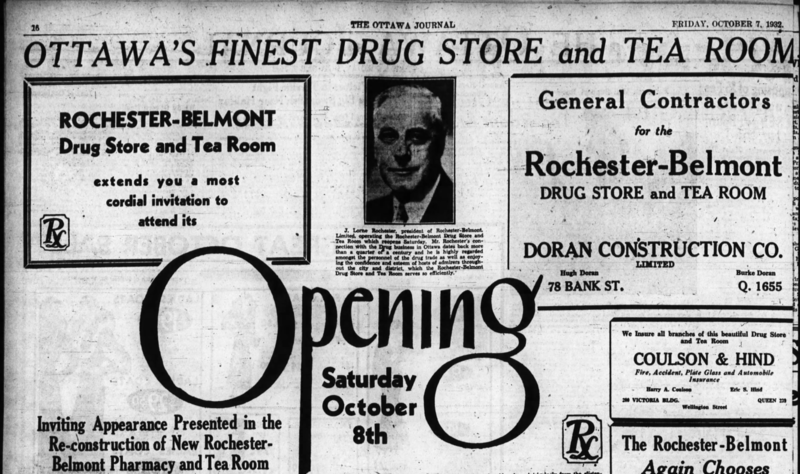 The advertisement Rochester had run in the Citizen stressed that it was not his first experience with a devastating fire: he had lost his drug store at Lebreton in the 1900 fire.76Ottawa Citizen, October 7, 1932, p. 17. Between the Depression reaching its depth in 1933 and the tremendous financial burdens of fire recovery, the Rochester-Belmont Pharmacy and Tea Rooms declared bankruptcy.77Ottawa Journal, February 13, 1933, p. 16. Could not hold on. Source: Ottawa Journal, February 13, 1933, p. 16. The ink on the deal dried on April 15, 1933: colourful theatre baron78For more information about the Columbia, Rex, and Avalon Theatres, see Miguelez (2004): 121-122, 131-134, 201-205. and future Ottawa mayor,79”P.J. Nolan Elected Mayor By 6,057 Majority Over Allen Brethour, Lewis, Geldert, Charpentier On 1934 Board,” Ottawa Journal, December 5, 1933, p. 14. Patrick Nolan, signed an agreement to purchase the Rochester-Belmont Pharmacy and Tea Room, the associated Rainbow Tea Room, and the Cavendish Cafe, further east up Sparks for $100,000. The three businesses would be operated by Nolan’s son, Ambrose. The Journal explained that Nolan was a pharmacist by trade and had actually studied pharmacy under Rochester when his business was located at Wellington and Booth. After three years focused entirely on theatres, he longed to get back into the pharmacy business.80”P.J. Nolan Buys Cavendish Cafe, Rochester-Belmont and Rainbow,” Ottawa Journal, April 15, 1933, p. 24. As the Depression reached its depth in 1933, demonstrations of faith in improvement were run in the local papers. Source: Ottawa Journal, April 22, 1933, p. 11. As the Depression wore on, business became harder and harder to conduct. Local papers were filled with advertisements, often collaboratively purchased and soaked in desperation, luring what little money remained in circulation to the neighbourhood. 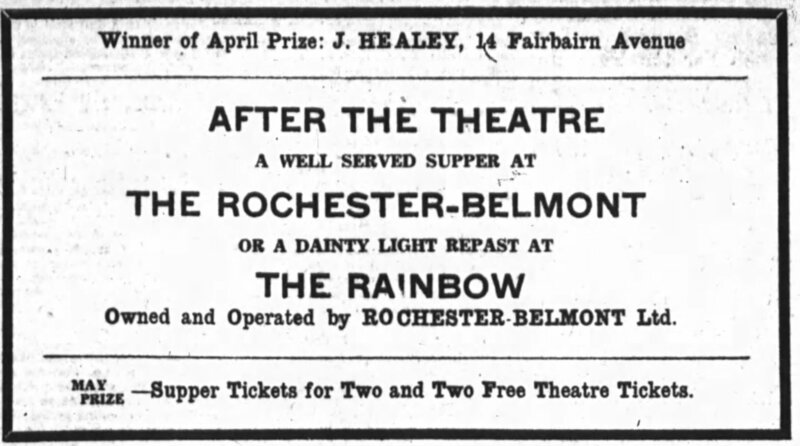 As owner of the Rochester Belmont and Rainbow Tea Room, the Nolans frequently involved themselves with these ads. Interestingly, these team efforts had something place-making effect. 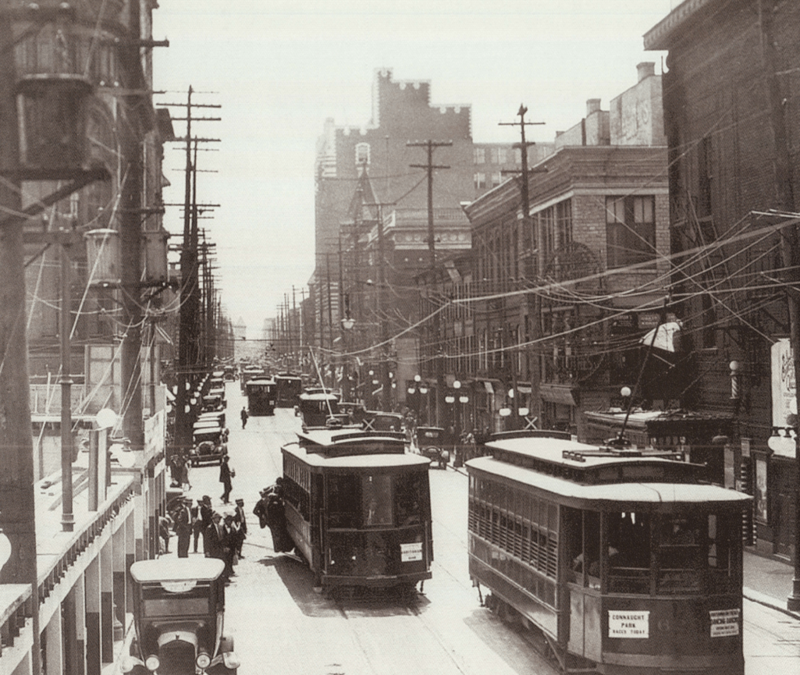 Building off of The 2 Macs’ “Busy Corner”, merchants on Bank between Sparks and Queen helped to define the area as a shopping and entertainment district. Admittedly, this was not an entirely difficult characterization to sell, as the block was bounded by two theatres.81Ottawa Journal, August 15, 1933, p. 11. “Shop in the Busy Corner” Source: Ottawa Journal, August 15, 1933, p. 11. It was almost as if the Rochester-Belmont was a hot potato. It’s not entirely clear just how long the Nolans retained ownership of The Belmont (they removed “Rochester” from the business name, operating at “Belmont Limited”), but it was only a brief period. On December 23, the Journal reported that Karson’s Limited had been recently incorporated82Ottawa Journal, December 23, 1933, p. 22. and on January 12, 1934, Ottawa was introduced to Karson’s Restaurant, Tea Room, and Koffee Shop.83Ottawa Journal, January 12, 1934, p. 14. Karson’s on Rideau. Undated. Source: Lost Ottawa / Facebook. Karson’s takeover of the Belmont’s space represented an expansion for ambitious confectioner and restauranteur Peter Karson. Karson’s Cafe and Grill on Rideau Street (beside the Woolworth’s) had already been quite a popular spot, with numerous expansions in its 14 years in business.84Ottawa Journal, July 16, 1921, p. 19; Ottawa Journal, July 27, 1928, p. 17. 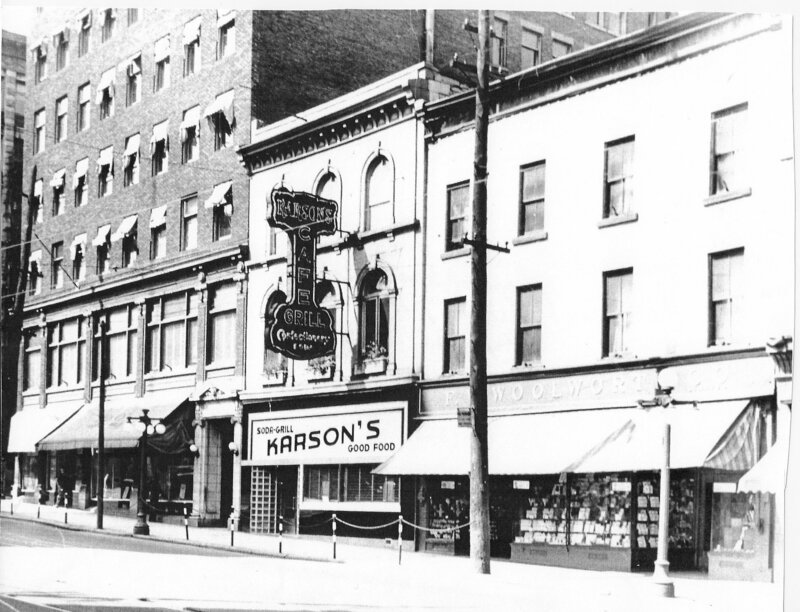 By 1930, Karson had broken into the Downtown/Midtown market with a Karson’s Lunch and Soda Fountain located at 165 Bank, directly across from the Jackson Building.85Ottawa Journal, June 20, 1930, p. 17. 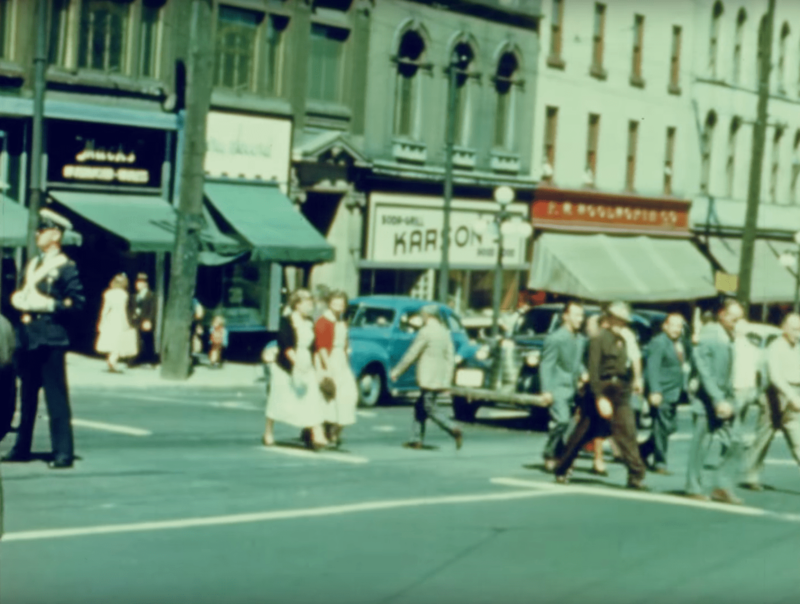 Still from “Safe Driving” (1949) showing Karson’s on Rideau. As the changeover was relatively minor – being chiefly interior renovations – business was only interrupted for a short time. Karson’s Restaurant, Tea Room and Koffee Shop were officially opened to the public on January 13, 1934. A new neon sign and gold-hued lights were added to the facade to capture the eye.86Ottawa Journal, January 12, 1934, p. 14. Under the management of Karson Ltd., Karson’s Restaurant, Tea Room, and Koffee Shop would provide the backdrop for a an eventful wartime period in Ottawa’s uptown area. I will continue on to that story in the next instalment, which involves crossing wartime labour, business, and currency regulations and a demonstration that while Prohibition might have ended, it still had a large number of proponents. 1. ↥ ”R.W. Stephens, Deputy Clerk of Senate, Dies,” Ottawa Journal, September 11, 1913, p. 13. 2. ↥ Hunter, Rose & Co.’s City of Ottawa Directory, 1870-71 (Ottawa: Hunter, Rose, & Co., 1870): 106. 3. ↥ Cherrier & Kerwin’s Ottawa Directory for 1872-1873 (Ottawa: Cherrier & Kerwin, 1872): 177. 4. ↥ Hunter, Rose & Co. (1870): 106. 5. ↥ The Civil Service List of Canada, 1885 lists Stephen as the 2nd English Clerk & Clerk of Routine Proceedings, a position that he had only held since March 1884. 6. ↥ Somtimes styled “Stephens“. His obituary cited above alternates the spelling between the headline and the text. 7. ↥ Stephens took out a $885 mortgage on the lot from Johnston Brown on August 8, 1864. Through some options and finagling, through his wife Victoria, he purchased from lot on December 24, 1867 from Charles Phinney for $1144, and on July 12, 1887, she transferred the deed to him. See Ottawa Land Registry Office, South Sparks / East, Lot 5, Reel 4AR117. 8. ↥ It’s worth noting that Robert W. Stephens’ Stephens Block was the first of two along Sparks. The second one was constructed in 1896/97 for the A.J. Stephens shoe store along Sparks and is still standing. For the building’s announcement, see “To Grace Sparks Street,” Ottawa Journal, February 21, 1896, p. 1. 9. ↥ ”City and Vicinity,” Ottawa Journal, September 6, 1887, p. 4. 10. ↥ ”Laid at Rest,” Ottawa Journal, May 13, 1892, p. 1. 11. ↥ See for example, The Ottawa Directory, 1888-1889 (Ottawa: A.S. Woodburn, 1888): 15. 12. ↥ Ottawa Journal, March 12, 1892, p. 4. 13. ↥ Ottawa Journal, April 6, 1892, p. 4. 14. ↥ There was a sign bylaw passed in 1917 which was, for the most part, modest relative to what was to later come and was generally most concerned with illuminated, rather than traditional painted signs. See “Electric Signs May Have Eight Ft. Width,” Ottawa Journal, August 4, 1916, p. 11; “In Future Signs Will Be Under Civic Control,” Ottawa Journal, July 17, 1917, p. 6; “The Sign Bylaw,” Ottawa Journal, July 21, 1917, p. 4; “Agents Of Govt. Fights Citizens Alderman Says,” Ottawa Journal, August 8, 1917, p. 9; “B. Slattery Asks For A New Park For Ottawa East,” Ottawa Journal, September 12, 1917, p. 14; “Mr. Fisher Refuses To Back City Bill,” Ottawa Journal, March 17, 1924, p. 2. Also see Alain Miguelez. Transforming Ottawa: Canada’s Capital in the Eyes of Jacques Greber (Ottawa: Old Ottawa Press, 2015). 15. ↥ Ottawa Citizen, April 27, 1897, p. 1. 16. ↥ Ottawa Journal, July 11, 1898, p. 6; Ottawa Journal, October 8, 1899, p. 6. 17. ↥ Ottawa Journal, March 22, 1900, p. 7; Ottawa Journal, August 25, 1900, p. 6. For examples occurring long after the closure of The 2 Macs, see “Chivalry Seen At Busy Corner,” Ottawa Journal, July 14, 1938, p. 16; Karson’s Restaurant continued to use the name: Ottawa Journal, September 19, 1940, p. 18; “Tram Jumps Track At Busy Corner Ties Up Traffic,” Ottawa Journal, December 27, 1946, p. 20; Ottawa Journal, February 4, 1949, p. 16; Ottawa Journal, July 21, 1951, p. 3; Ottawa Journal, December 26, 1958, p. 6; W.Q. Ketchum. “Ottawa’s Verdict: ‘Mall a Marvellous Job’,” Ottawa Journal, May 20, 1960, p. 3; Ottawa Journal, July 23, 1960, p. 3; Gord Lomer. “Below the Hill,” Ottawa Journal, June 18, 1965, p. 25; W.Q. Ketchum. “Faces of Ottawa: William Donald Cutler,” Ottawa Journal, October 24, 1970, p. 2. 18. ↥ ”Mc. McClenaghan Obtains Control Over the Entire Block on the ‘Busy Corner’,” Ottawa Journal, December 17, 1902, p. 3. 19. ↥ ”Another Big Queen St. Building,” Ottawa Journal, September 6, 1913, p. 1. 20. ↥ ”R.W. Stephens, Deputy Clerk of Senate, Dies,” Ottawa Journal, September 11, 1913, p. 13. Stephens was also integral to seeing through the construction of the Masonic Temple that once stood on Metcalfe. 21. 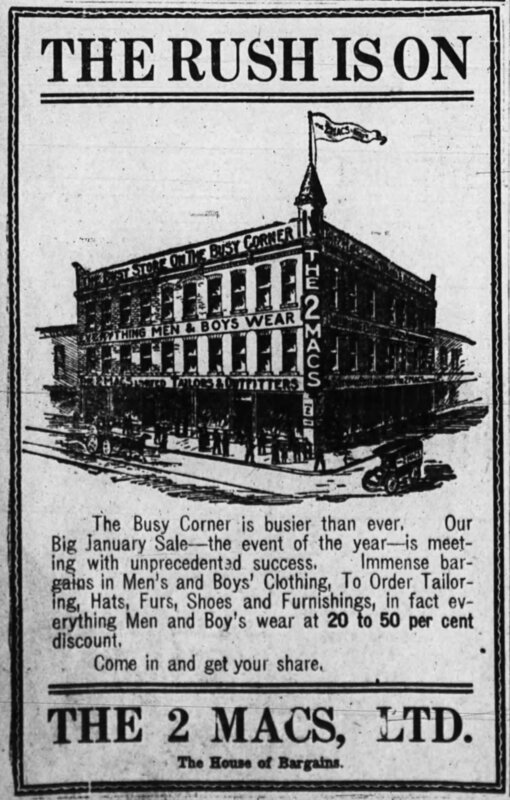 ↥ ”New Business Block For ‘Busy Corner’,” Ottawa Journal, January 25, 1923, p. 1. 23. ↥ Ottawa Journal, January 26, 1923, p. 14. 24. ↥ Ottawa Journal, March 16, 1923, p. 16. 25. ↥ ”Won’t Continue Wall Along Rideau Canal,” Ottawa Journal, February 7, 1923, p. 15. 26. ↥ ”Earlier Elections Depend on Assessor,” Ottawa Journal, March 7, 1923, p. 4. 27. ↥ ”Board of Control Recommends The Appointment of Successor to Head of Charity Department,” Ottawa Journal, March 14, 1923, p. 14. 28. ↥ Ottawa Journal, April 10, 1923, p. 14. 29. ↥ ”Oppose Widening of Bank St. Blocks,” Ottawa Journal, April 25, 1923, p. 13. 30. ↥ ”Board Discusses Bank Street Width,” Ottawa Journal, April 27, 1923, p. 2. 31. ↥ ”Two Macs To Move To Daly Building,” Ottawa Journal, April 26, 1923, p. 22; Ottawa Journal, April 27, 1923, p. 16. The 2 Macs did not move to the Daly Building in the end, but rather moved to 194-196 Sparks Street, just on the other side of the Sun Life building on the opposite corner. Neither the sluggish economy nor the new location (however close) were kind to The 2 Macs: the business had shuttered by the Fall of 1925. See Ottawa Journal, May 15, 1923, p. 16; Ottawa Journal, May 16, 1923, p. 16; Ottawa Journal, September 5, 1925, p.18. Store fixtures were liquidated in the Spring of 1926 after the remaining stock was. See Ottawa Journal, March 16, 1926, p. 15. 32. ↥ ”Select Toronto Man For Social Service,” Ottawa Journal, May 7, 1923, p. 4. 33. ↥ ”Ottawa Adds Appeal For Lower Coal Rate,” Ottawa Journal, May 9, 1923, p. 15. 34. ↥ ”Widening Of Street Rejected By Council,” Ottawa Journal, May 23, 1923, p. 5. 36. ↥ Ottawa Journal, September 14, 1923, p. 15. 37. ↥ Nathan Smith. Comrades and Citizens: Great War Veterans in Toronto, 1915-1919 (PhD diss. : University of Toronto, 2012): 32. 38. 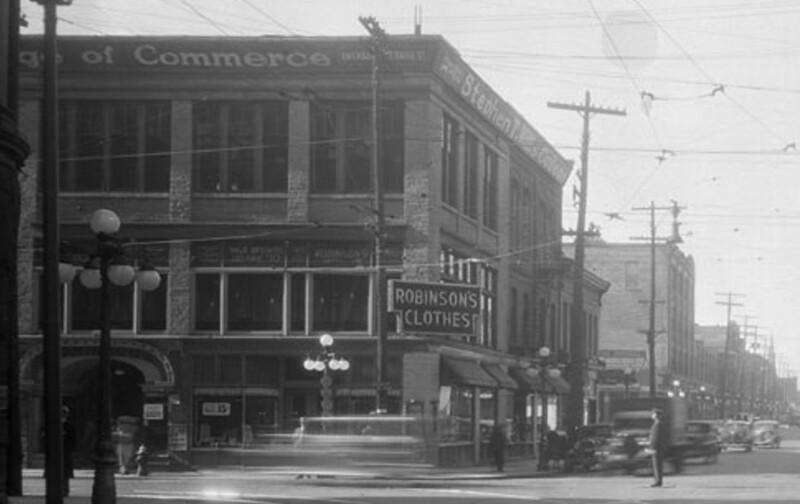 ↥ The last mentions of Robinson’s Clothes I was able to find in the Journal were in 1946, when an OTC streetcar jumped the tracks in front and when the building experience another fire in 1947. The Citizen’s archive, as reproduced on Google News is far too spotty in the time period to make a call on it. See “Loaded Tram Jumps Track,” Ottawa Journal, February 26, 1946, p. 20; Ottawa Journal, June 17, 1947, pp. 1, 12. 39. ↥ Ottawa Journal, February 26, 1948, p. 30; Ottawa Journal, September 18, 1948, p. 15. 40. ↥ Ottawa Journal, February 3, 1970, p. 27. By the spring, ads for Renaud’s Golf School had been run for the address, 62½ Bank, came to replace those for the dance school. See Ottawa Journal, March 21, 1970, p. 14. 41. ↥ I should also note that of the storefronts in the brick building (64-82 Bank Street), The 2 Macs had been present in a number of them before moving to Sparks Street. As The Embassy was only present in 60 and 62 Bank, my focus is on those addresses. 42. 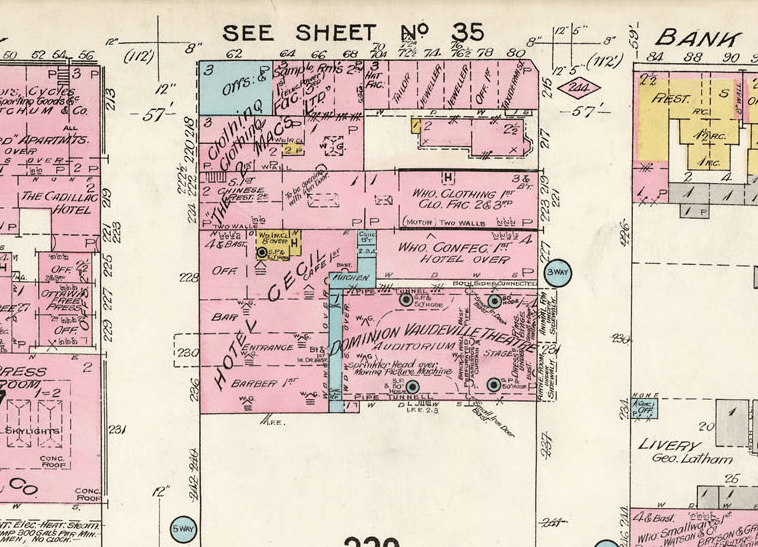 ↥ Baird’s practice had been located in Stephens Block since 1898. Ottawa Journal, November 14, 1923, p. 23. 43. ↥ Ottawa Journal, February 10, 1921, p. 13. Before getting into the drug store business, Isaacs briefly operated as a furrier in the Russell Building, in a unit recently vacated by the Canadian Northern Railway system. See Ottawa Journal, December 2, 1919, p. 8. 44. ↥ Ottawa Journal, November 23, 1923, p. 14. 45. ↥ Ottawa Journal, November 23, 1923, p. 15. 46. ↥ J. Rattray Wilson. “Electric Lighting for Dwelling Houses,” The Western Architect 17, no. 2 (February 1911): 22-26. 47. ↥ The Ottawa City Directory, 1909 (Ottawa: Might’s Directories Ltd., 1909): 135; The Ottawa City Directory, 1912 (Ottawa: Might’s Directories Ltd., 1912): 150. 48. ↥ Ottawa Journal, September 14, 1925, p. 2. 50. ↥ ”Big Loss By Smoke In Bank St. Fire,” Ottawa Journal, March 8, 1925, pp. 1-2. 51. ↥ ”Stephen Building Is Bought By Syndicate Ottawa Capitalists,” Ottawa Citizen, December 17, 1926, p. 1. 52. ↥ Ibid. ; “Stephens Block Changes Hands In Large Deal,” Ottawa Journal, December 17, 1926, p. 1. 53. ↥ Ottawa Land Registry Office, Plan 3922, South Sparks, East Portion, Lot 5, Reel 4AR117. 54. ↥ ”Important Sites Are Purchased On Two Streets,” Ottawa Journal, January 24, 1927, p. 2. 55. 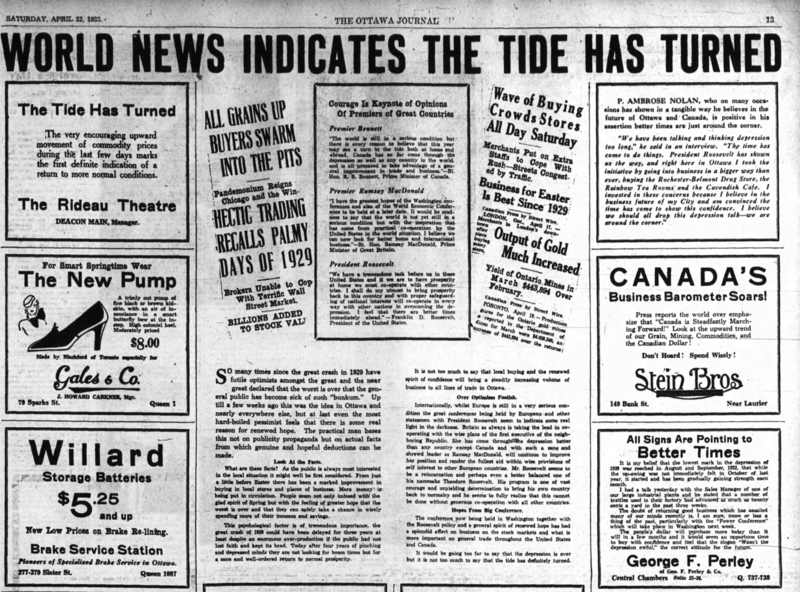 ↥ ”1928 Looks Like Another Banner Year In Ottawa,” Ottawa Citizen, November 3, 1927, p. 1. 56. ↥ ”May Not Renew Tenants’ Leases,” Ottawa Journal, November 4, 1927, p. 19. 57. ↥ Gleeson had been busy through 1928 as well, raising capital for the Victoria Building on Wellington. See Ottawa Journal, February 27, 1928, p. 15. 58. ↥ Ottawa Journal, June 21, 1929, pp. 14-15; Ottawa Journal, October 5, 1929, p. 12. 59. ↥ ”Ammonia Fumes Hamper Firemen In $15,000 Blaze,” Ottawa Journal, August 1, 1932, pp. 1,2. 60. ↥ ”Say Incendiarism Cause of Outbreak Bank and Sparks,” Ottawa Journal, August 31, 1932, p. 20. 61. ↥ ”No Firemen Under Suspicion of Chief Blackler,” Ottawa Citizen, October 4, 1932, pp. 1, 8. 62. ↥ Originally the Family Theatre. See “Loss is $15,000 When Theatre Scene of Fire,” Ottawa Journal, August 6, 1932, p. 4. For more information about the Embassy, see Alain Miguelez. A Theatre Near You: 150 Years of Going to the Show in Ottawa-Gatineau (Ottawa: Penumbra Press, 2004): 68-80. 63. ↥ ”Cyr Hotel Suffers $15,000 Damage In Early Sunday Fire,” Ottawa Journal, September 19, 1932, p. 3. 64. ↥ ”No Firemen Under Suspicion of Chief Blackler,” Ottawa Citizen, October 3, 1932, p. 8. 65. ↥ ”50 Witnesses Called For Ottawa Fire Inquiry,” Ottawa Journal, October 4, 1932, p. 1. 66. ↥ ”Evidence Reveals Similarity Of Recent Suspicious Fires,” Ottawa Journal, October 5, 1932, p. 3. 67. ↥ ”Marshal Hints at Charges Unless Fireman Will Talk,” Ottawa Journal, October 7, 1932, p.25. 69. ↥ ”Contempt of Court,” Ottawa Journal, October 14, 1932, p. 4. 70. ↥ ”To Stay In Jail Until Term Ends,” Ottawa Journal, October 19, 1932, p. 19. 71. ↥ ”Has Not Decided What He Will Do With MacRostie,” Ottawa Journal, October 25, 1932, p. 1. 72. ↥ ”City Fireman Is Remanded For One Week,” Ottawa Journal, October 26, 1932, p. 1. 73. ↥ ”Defence Council for City Fireman Announces He Will Ask for a Re-trial Immediately- Accused Goes to Stand,” Ottawa Journal, December 8, 1932, p. 5. 74. ↥ ”Roy MacRostie Given Acquittal,” Ottawa Journal, June 7, 1933, p. 3. 75. ↥ Ottawa Journal, October 7, 1932, pp. 16-17. 76. ↥ Ottawa Citizen, October 7, 1932, p. 17. 77. ↥ Ottawa Journal, February 13, 1933, p. 16. 78. ↥ For more information about the Columbia, Rex, and Avalon Theatres, see Miguelez (2004): 121-122, 131-134, 201-205. 79. ↥ ”P.J. Nolan Elected Mayor By 6,057 Majority Over Allen Brethour, Lewis, Geldert, Charpentier On 1934 Board,” Ottawa Journal, December 5, 1933, p. 14. 80. ↥ ”P.J. Nolan Buys Cavendish Cafe, Rochester-Belmont and Rainbow,” Ottawa Journal, April 15, 1933, p. 24. 81. ↥ Ottawa Journal, August 15, 1933, p. 11. 82. ↥ Ottawa Journal, December 23, 1933, p. 22. 83. ↥ Ottawa Journal, January 12, 1934, p. 14. 84. ↥ Ottawa Journal, July 16, 1921, p. 19; Ottawa Journal, July 27, 1928, p. 17. 85. ↥ Ottawa Journal, June 20, 1930, p. 17. 86. ↥ Ottawa Journal, January 12, 1934, p. 14. Wonderful research. As a part time history nerd, and full time Arthur Murray Dance Studio owner, this was a great read. We are trying to track down old Arthur Murray locations and any of the local or oral history surrounding the locations. We’d love to link to this article or even interview you at some point for this project. Thank you for taking the time to take a deep dive on this topic, and it uncovered an Arthur Murray gem for me. Thanks so much! And sure thing, link away!